In 1922, Mustafa Kemal Ataturk led Turkish forces to defeat the Greek Army, marking the end of the Greco-Turkish War. The devastation of this “Asia Minor Disaster” had a huge impact—even framing Ernest Hemingway’s point of view as a young journalist in Eastern Thrace. 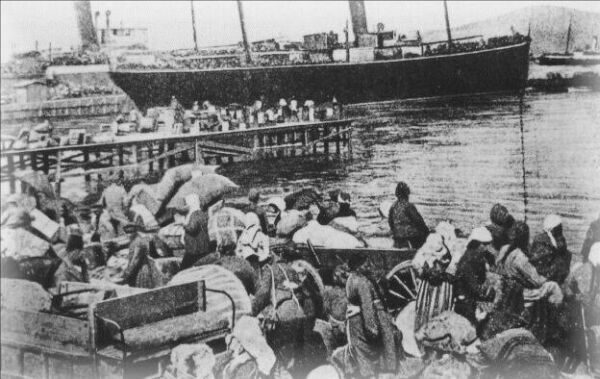 After the ignominious retreat of Greek troops, the burning of the city of Smyrna (modern-day Izmir), and the loss of Eastern Thrace, one million refugees, mostly Greeks and Christians, fled their homeland to seek shelter in Greece. With them they brought their personal belongings, including icons. Shimmering with gold, glass, and silver, this nearly four-foot-high mosaic icon of the Virgin and Child exemplifies the splendor that is Byzantine art. Written above the Virgin’s left shoulder, the red inscription “Mother of God the Episkepsis” refers to Mary’s role as the Virgin of Shelter, a holy protector known for her miraculous intervention in times of need. Similar inscriptions are found on lead seals used to authenticate correspondence in Byzantium. Depicted holding the Christ Child in her right arm, the Virgin Mary, dressed in blue and gold and framed by a halo, lifts her left hand in prayer, illustrating her role as intercessor for all believers. The notch at the center of the base suggests that an attached pole would have held the icon aloft during processions; the icon’s large scale and monumentality, however, demonstrate that it would have been displayed for special veneration in the icon screen of the altar. Seeking assistance in a time of emergency, those encountering the icon could appeal to the Virgin Mary for assistance, comfort, and unyielding love in times of uncertainty, change, and fear. The icon has been linked to the Church of Panagia Pantobasilissa (Kemerli kilise), one of the most important late Byzantine constructions in the region of Bithynia. Erected around 1336, the church remained exclusively in Christian hands until 1922. Today the domed structure stands in ruins. Recently purchased by the Metropolitan of Bursa, this venerable church will be restored by an international team of specialists as soon as funding is secured. 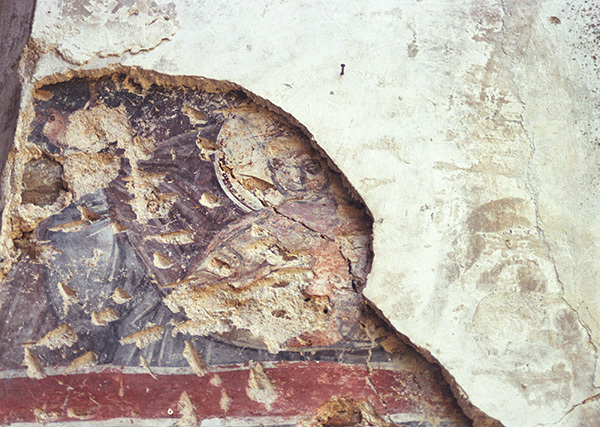 Traces of frescoes from the 14th century include a series of funerary portraits in the westernmost bay, as well as images of saints and narrative scenes from the life of the Virgin. Many of the original paintings were covered in 1723 by a layer of paint and then by a subsequent layer of whitewash. In several locations, tantalizing glimpses of the 14th-century frescoes appear beneath these later layers, revealing the work of a master painter. Perhaps the mosaic icon of the Virgin was originally created for the use of Orthodox supplicants in this church—like the elegant lady memorialized in fresco on the south wall of the Panagia Pantobasilissa (shown above). Or perhaps it came into the church’s possession as other monasteries and churches in the area, like St. Stephanos (Fatih Camii), were converted for use as mosques during the Ottoman period. 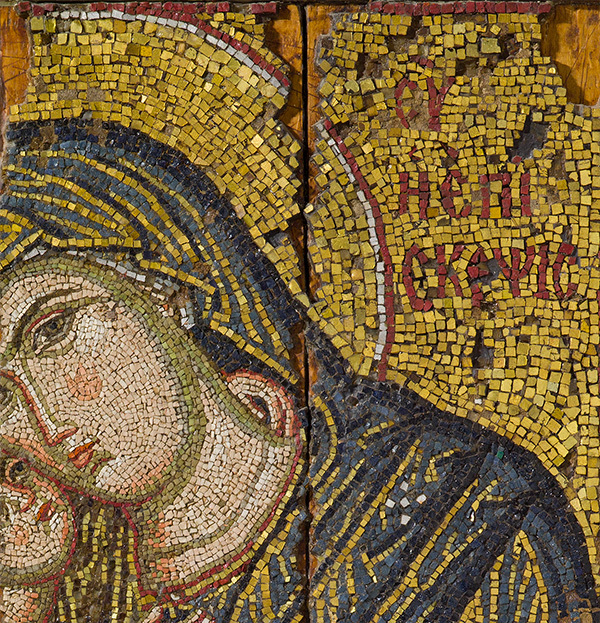 Whatever its provenance, there can be no denying the importance of the work as a rare example of a large-scale mosaic icon, for its radiant beauty and use of a rare epithet for the Virgin. 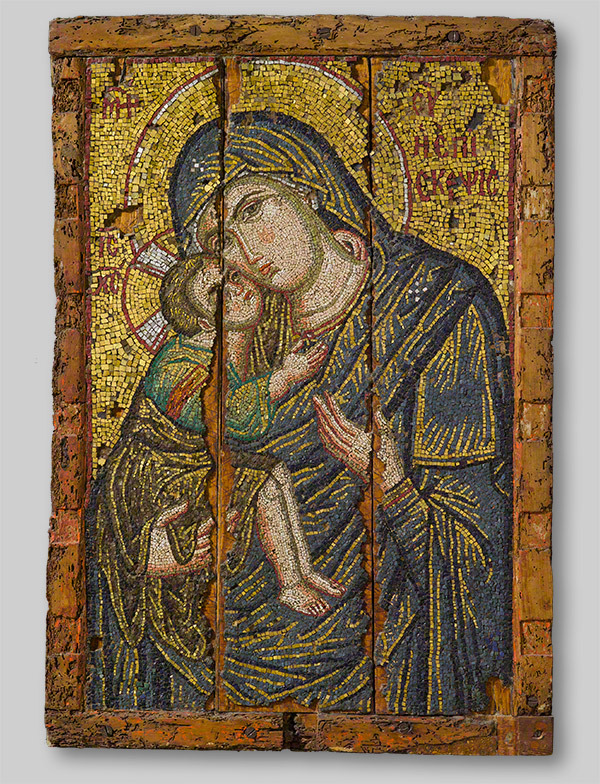 The mosaic icon of the Virgin Episkepsis is not only a testament to the artistry of Byzantium, but it also preserves the story of a people displaced from their home, forced to start anew, remembered in the physical damage the icon holds, visible in the lost tesserae and missing frame. Appealing to the Virgin of Shelter, who comforts the weary and the weak in times of need as she tenderly holds her child who will suffer unimaginable pain, the villagers of Trigleia could find refuge and peace in the shelter of her embrace. 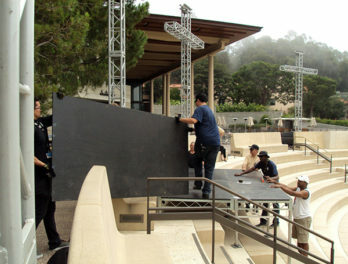 The appearance of the Virgin of Shelter in Los Angeles recalls this story and also holds hope for the restoration of the church that once sheltered her. Text of this post © Maria G. Psara. All rights reserved. I'm a fourth-year student at UCLA majoring in political science and minoring in art history. After graduation she will be attending the London School of Economics and Political Science to pursue an MSc in Conflict Studies. Of Greek heritage, Maria has been surrounded by the icons and mosaics of the Greek Orthodox Church since childhood. 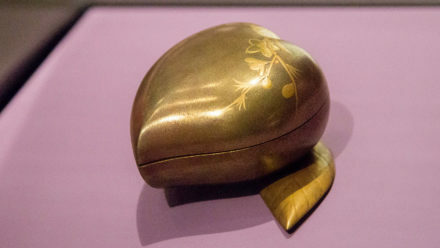 For her, the objects of the exhibition Heaven and Earth represent the dynamic history and culture of an empire that has had such an impact for so many. 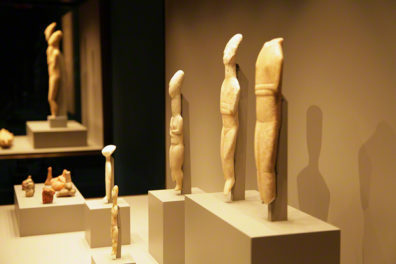 Great article on one of the most significant pieces on display at the Getty Villa as part of the Heaven & Earth Exhibit! A truly magnificent icon and a very great historical description-beautifully written by Maria G. Psara. I personally have many memories of my parents discussing all this devastating history of that time. Thank you, Maria. The importance of this era, and the preservation of the art, culture and history of the related regions, is of special significance to me. Thank you for contributing such a wonderful article. Breathtakingly beautiful. Grateful to learn more about these periods of history.